The 7-songs album is gentle and lyrically rich. Sirivennela gets to pen the five numbers each having a profound context. Shankar Mahadevan, Karthik, Ranjith, Suchitra, Geetha Madhuri, Vijay Prakash, Haricharan are the singers. Sirivennela's lyrics evoke a feeling of listening to Nagarjuna's glorification of youthful energy in Geethanjali. It will be interesting if this song features Nag. Shankar Mahadevan is in his elements while singing this song whose mood is energetic. Gopi Sunder's music needs proper visual justice. The song has gentle, lilting feel. Sirivennela's lyrics capture the beauty of living life every moment. It brims with optimism and as Gopi Sunder's music scales up in tempo, it's a poetic treat for sure. Karthik's voice is apt, his highs and lows are deft. All in all, a solid musical experience. Nowhere does the song sound like a semi-massy song. Gopi Sunder packs in class. The music does have the inspiration of an AR Rahman for sure. Ramajogayya Sastry's lyrics are imbued with Telugu nativity. Ranjith and Suchitra come with vibrant vocals for a romantic number like this. The song brings out the innermost, heart-felt feelings of a grateful soul. Sirivennela's lyrics are easy to understand even while being poetic and profound. 'Nee valle kada kalisa nanne nenila' and such lines are evocative. Vijay Prakash's nasal twang is apt for this song where Gopi Sunder tries to achieve a Rahmanesque intensity. Sirivennela's lyrics yet again mirror the optimism of a playful soul who lives the moment. Lines like 'Gunde layaku, kottha parugu' come with a celebratory tinge. Haricharan's electric voice is totally apt; listening him sing cheerfully is a treat. Gopi Sunder gives a song that is hummable. And the item song is here. Who else could have rendered it so vigorously except Geetha Madhuri? Ramajogayya Sastry marshals his item song-writing skill for this number, which has Tagubothu Ramesh giving away the prologue. Routine usages like Whatsapp, Twitter, Instagram, social media, etc make the song jaded. Gopi Sunder's musical output is sub par; it is more inspired lyrics-wise, music-wise. This is perhaps the best song - lyrics-wise, music-wise, and vocals-wise. Gopi Sunder's tuning and instrumentation seems to follow the broad template set by the pioneer Maestro Ilayaraja. Karthik's voice is mellifluous for a song of this sort. As for Sirivennela's lyrics, they come with overpowering lines like 'Nee oopire nee thodu ga', 'nee oohale nee dariga.. nine nuvu ventadaga', 'kashtalane kavvinchaga.. kanneellane navvinchaga' and the like. 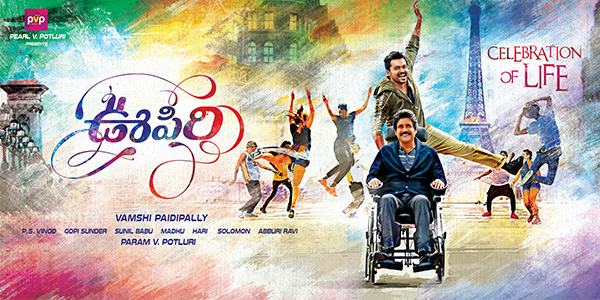 Verdict: For a metaphorical title like Oopiri, Sirivennela creates an imaginative lyrical world. Gopi Sunder does full justice with his refreshing approach.